Over 350 Amazon customers gave reviews. Of those, 60% gave 5-star ratings. 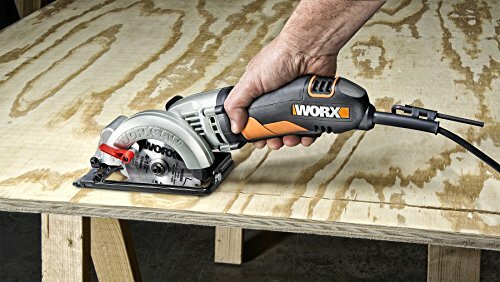 Worxsaw WX429L review: The Worx brand may not be as well-known such as the likes of DeWalt, Makita etc, being a relatively new name when compared to all the established big brand names, but it’s made a significant impact on users in a niche not that well-covered by anyone else. It’s a compact and lightweight circular saw – specifically the Worxsaw WX429L. It’s already achieved ‘Best Seller’ status on Amazon and gets an average 4-star rating across hundreds of users. Let’s take a closer look at the function and feedback of this great tool. Why would you want the Worxsaw WX429L? It’s great for making fast, accurate cuts in light timber. You don’t need to set up bigger, more complicated circular saws. It’s less tiring than holding a much heavier tool. It’s more comfortable for those with smaller hands. While there are many different makes and models of circular saws, one that we would highly recommend would be this WORX WORXSAW WX429L. This circular saw is compact, but don’t let that fool you, because it is quite powerful for its size. The WORXSAW is substantial enough to be able to cut through 2” lumber, yet on the same note, it is light enough for the average DIY’er to comfortably maneuver. With this circular saw, you will be able to cut tile, wood, metal, or plastic without any problems (although please note you will need the appropriate saw blade to be able to cut some materials – see later). It’s about time there’s an alternative to the traditional bulky full-size circular saw. The bevel angle adjustments and the cutting depth will accommodate almost any average project you have around the home. Cuts in a Single Pass – This saw is capable of cutting 2×4’s in a single pass. It’s not hard to use either – it is easy to maneuver this compact saw. In fact, we believe it weighs 50% less than the normal 7-1/4” circular saw. Easy-Set Depth Gauge Level – That’s right, this saw has an easy-to-set depth gauge level. You can adjust from zero to 1-11/16 inches at 90 degrees. Not only that, it also contains bevel settings for adjustments from 0-45 degrees, making it quick to easily adjust. Thin Blade – We really like the thin blade. When a circular saw contains a thin blade, you don’t have to strain as much with it. This results in a full size circular saw cutting performance and speed. Left-Sided Blade Design – The left-sided blade design, in our opinion, is great as it makes for good cut-line visibility. But it doesn’t matter if you are left-handed (yes, you can use in your left-hand too), as the pointer is easily visible no matter which side you use it. The grip has an integrated safety trigger, for added comfort, control and balance. 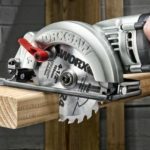 What’s Included with the Worxsaw WX429L? Inside the box, you’ll discover the 4-1/2” WORXSAW, a Parallel Guide, 24T Carbide-tipped Blade, Allen Key, Vacuum Adapter and of course, a manufacturer’s 3-year warranty. That’s right, we just said it comes with a 3-year warranty, which is much more than what most of the other companies are offering. Yes! This package actually includes a parallel guide or rip guide. If you’ve read other reviews on this site you’ll know a constant gripe is the fact a rip guide is not usually included. So full marks for that. We know not everyone wants one, but some people do. Don’t forget, the 24T blade included is for rough timber use. If you want a fine finish (ie no splinters), you’ll need a finer blade like a 60T. If you’re looking for a circular saw that isn’t bulky like the traditional ones, then the WORX WORXSAW WX429L might just be a suitable choice for you. It’s small, but as we said before, don’t let this fool you, because sometimes, big things really do come in small packages. I hope you found the Worxsaw WX429L review useful. Let us know how you got on.